Which is Best: Invisalign in Long Island City Vs. Braces? If there was a way for you to close the gap between your teeth without brackets and wires, wouldn’t you want to try it out? To some patients, anything is better than having their appearance blemished by metal in their mouth. If you’re the type of person that values their mature appearance but also wants to straighten their smile, Invisalign in Long Island City may be the best orthodontic option for you. Learn more about the system and why people are choosing it over traditional braces in this week’s blog post! If you’re not familiar with the system, Invisalign utilizes a series of smooth, clear plastic aligners to fix the alignment of your teeth. These custom clear aligners apply just enough pressure to guide your teeth into their correct positions. The system consists of enough custom trays to complete your treatment (usually 6 months to a year’s worth). You’ll simply trade out your aligners every few weeks to continue the treatment. Before you know it, you’ll have the straight smile you’ve been wanting for years! Why Are People Turning Towards Invisalign Compared to Other Orthodontic Options? Fewer dental appointments. You only need to visit the dentist for your regular cleanings or if you damage the trays in the system. Even if you lose one, you can simply wear the next aligner in the series rather than taking the time to visit your dentist. Easier maintenance. It’s difficult to clean your teeth with metal brackets and wires in the way. Invisalign is removable, so you can simply take out your aligner tray and brush/floss your teeth. Be sure to clean your tray before replacing it! Less irritation and discomfort. Since Invisalign is created from smooth plastic, you won’t have to worry about damage to your gums or cheeks from your orthodontic treatment rubbing against them. It’s discreet! Many people love the Invisalign system because the trays are practically invisible, so you can continue straightening your teeth with confidence. 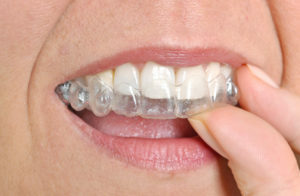 The first step to getting Invisalign is to visit your dentist in Long Island City for a consultation. Your dentist will evaluate the current state of your smile, discuss your lifestyle and how Invisalign may or may not work for you, and take impressions of your teeth if it is a fitting treatment. You’ll be well on your way to achieving your smile goals! Here at LIC Dental Associates, we want to help patients improve their smile in comfortable, non-invasive ways. Since every mouth is different, we offer a variety of options to choose from. Learn about which may be the best treatment for you by giving us a quick call today!